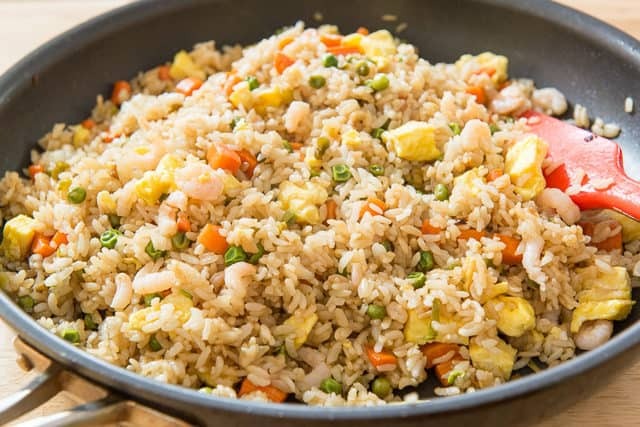 Even though fried rice is often made as a side dish to Chinese main entrees like Orange Beef or Kung Pao Chicken, often times I’ll make a big bowl of fried rice and have it all on its own. 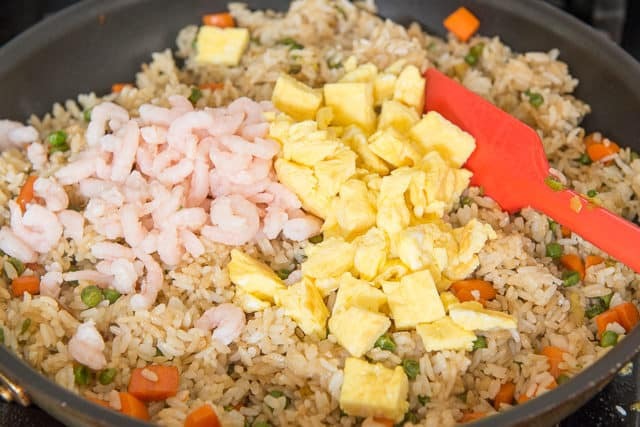 You can certainly add different kinds of protein to the fried rice to make it good enough for dinner. My favorite version has shrimp and egg in it, but you could also add pork, chicken, or any other ingredients you’d like. 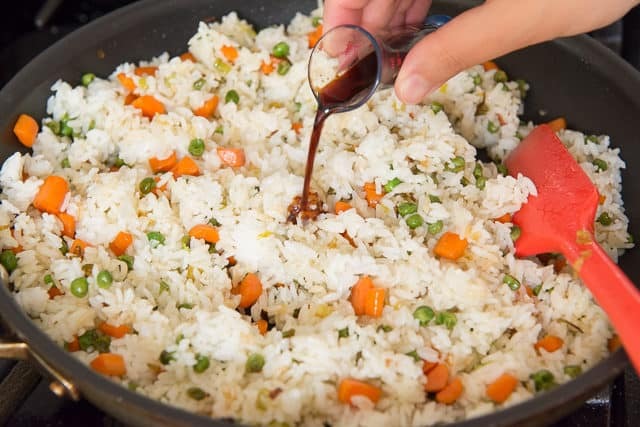 Fried rice is one of the most nostalgic dishes from my childhood, and one of the first recipes I learned how to make from my mom. The exact rendition depended on what needed to be cleared out of the fridge, but this was always the version I liked the most. 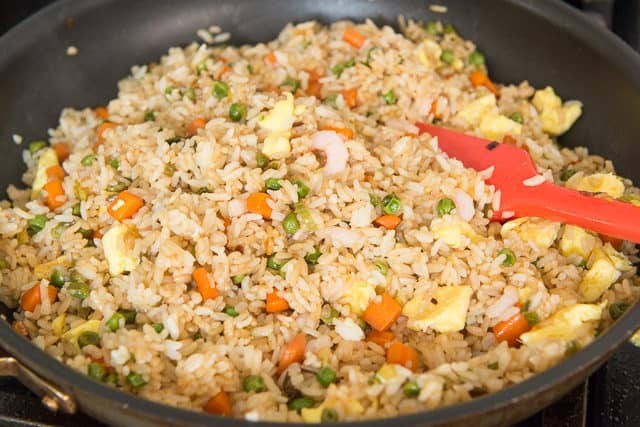 Most of the work involved in fried rice is just prepping a few of the vegetables. Otherwise, it’s pretty quick and easy to make. The first thing you want to do is make the egg. For fried rice, I think cooking the egg separately is SO much better than cracking an egg straight into the rice and stirring it around. Some of my favorite Asian recipes to serve this with are Orange Chicken, Beef and Broccoli, and Honey Walnut Shrimp. You can also try this Cauliflower Chicken Fried Rice for a lower carb version! Can fried rice be frozen? Yes, for up to two months in an airtight container. 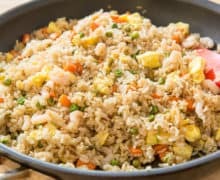 Can fried rice be healthy? Healthy means different things to different people, but I eat this during keto for my carb-ups. It’s gluten-free if you use tamari. How to reheat fried rice: There are two ways I recommend. You can do it in the microwave, but make sure you have some sort of lid or plate on top of it to trap the moisture and steam the rice, otherwise you’ll get hard and dried out rice instead of fluffy rice. You can also re-heat it in the skillet, stir frying it to rewarm. 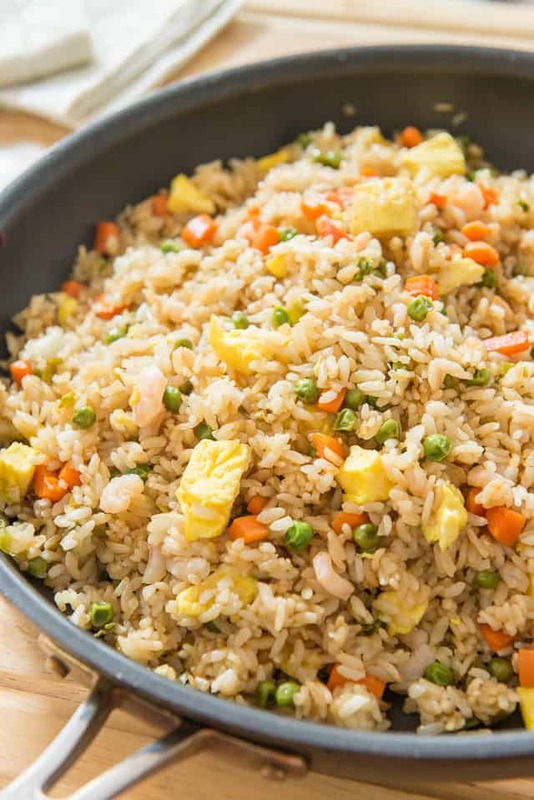 This classic fried rice recipe takes leftover white rice and turns it into a delicious dinner with carrots, shrimp, and more! Whisk the eggs in a bowl with a tablespoon of water and a pinch of salt (or 1 tsp of soy sauce), until blended. Heat one tablespoon of oil in a large nonstick skillet set over medium heat, and add the beaten eggs. Let the eggs cook for a couple minutes, not moving the egg around the pan, but just letting it sit until it sets into an omelet. 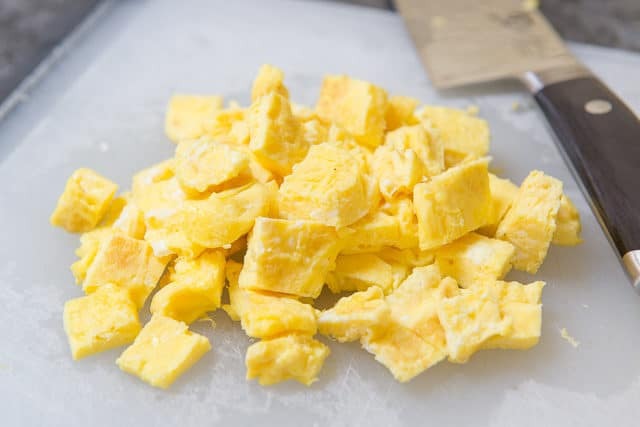 Remove the egg to a cutting board, and chop into big pieces. 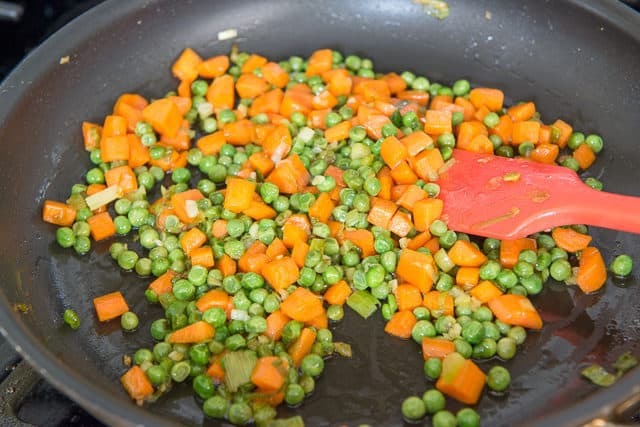 Add two tablespoons of oil to the skillet over medium high heat, and add the carrots, peas, and scallions. Add 1 tbsp of soy sauce, and cook for about 5 minutes, until the carrots soften slightly. Add the leftover rice, and toss around for 1 minute, trying to break up any clumps of rice. Add 2 tbsp of soy sauce and the remaining tablespoon of oil, frying and tossing the rice for 3-4 minutes. Add the shrimp, egg, and remaining tablespoon of soy sauce, and toss for 2 more minutes, until the rice looks evenly brown. Enjoy! Post updated in August 2018 with new photos, writing, and tips. Originally published March 2012. Can it be fresh rice and leave out the scaliions? Yes, freshly cooked rice works equally as well. It will be fine without the scallions. You can use fresh rice, but I have found that it tends to come out soggy when you do that. Rice that has been in the fridge for a day or two seems to work best. Also to avoid breaking up the lumps in the pan, put the leftover white rice you will be using for fried rice into a plastic gallon bag. Then before you put the rice in the pan, break up the lumps in the bag before you pour it out. This makes it easier to cook. What kind of rice works best? White, brown or something different? White rice is my preference but you could probably use brown too. Many different types are all suitable, just different. I tend to use a short grain white, but you may find you prefer a medium or long grain white rice.